Our men’s schola have become quite a “band of brothers” as they also gather occasionally in Father Rick’s man cave for what we call, “Pipes and Pints” … Virtually all of them enjoy a nice pipe and brew as we discuss church related issues and try to solve all of the problems of the world. Virtually all of these men are young professionals. The KDM Schola sings for our monthly Knights of Divine Mercy evenings in our parish. 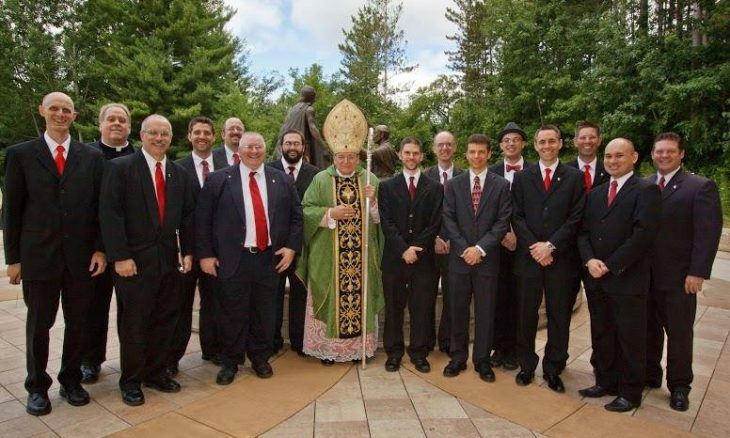 They are also invited to sing at such things as a Mass with Cardinal Burke, every Summer. If you are interested, contact Aristotle Esguerra at (608) 514-4391.